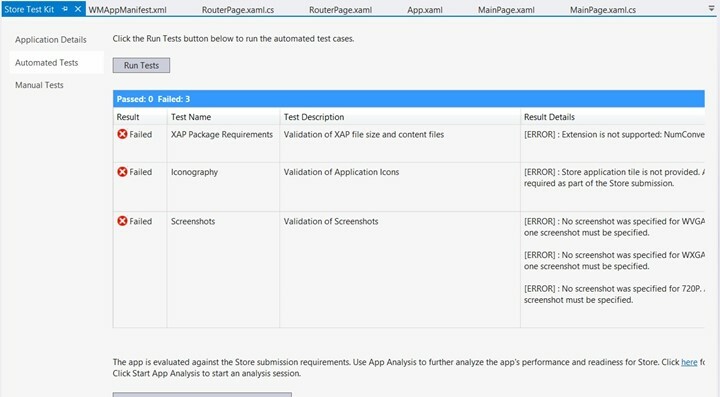 Finding out App Capabilities with the Store Test Kit. The Windows Phone SDK comes with a bunch of tools and one of the tool is the Store Test Kit that lets the developers to analyse the capabilities required by the App. 1. Open the Windows Phone App in Visual Studio 2012 and build the app in the Release Configuration. 2. Launch the Store Test Kit. 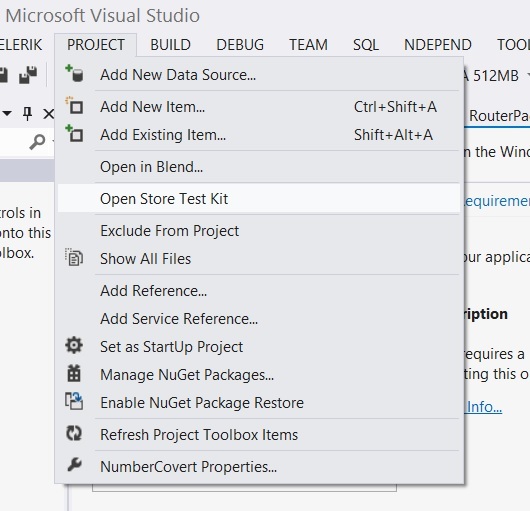 There are 2 ways by which you can launch the Store Test Kit. 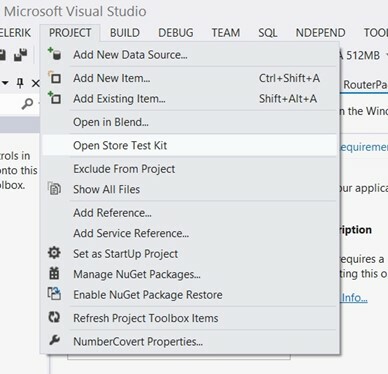 Click Project Menu and then select “Open Store Test Kit”. Right click on the project and click “Open Store Test Kit”. 3. Click the “Run Tests” button in the Automated Tests tab to start the analysis process. If the App is compiled for the first time or if the app is running in the debug configuration mode, you might receive the following error. The application package (XAP) is not up-to-date. Recompile and try again. Change the solution configuration to Release and platform to ‘AnyCPU’ and rebuild the app. In this case, just set the mode to “Release” and rebuild the project and then click the “Run tests” button. 4. The tests should start and the results will be shown immediately. This result will help the developer to rectify the issues in the app before submitting to the windows phone store. Note that some of the automation tests like Iconography and Screenshots fail because of the validation of the Application Icons and Screenshots.